A new type of 6-sided die, called an X-die, is proposed where instead of the faces being numbered 1 to 6 as usual, the faces are numbered with positive whole numbers such that their sum is 21. In this problem we will say that a die $A$ is worse than a die $B$ if and only if $P(A< B) > P(B< A)$ for a single throw. Conversely, a die $A$ is better than a die $B$ if and only if $P(A< B) < P(B< A)$ for a single throw. 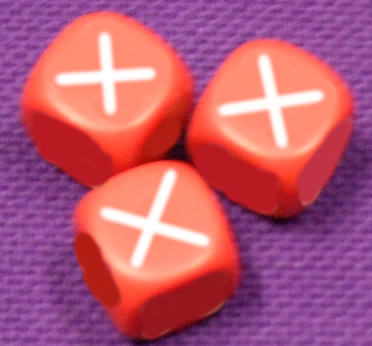 Can you create an X-die which is worse than an ordinary die? Can you create an X-die which is better than an ordinary die using only the numbers $1$ to $6$ (you don't have to use all of the numbers!)? Be clear in your explanations or reasoning. You can prove your results using algebra or explore the problem experimentally using a spreadsheet. Extension: Explore the notion of a 'worst' or a 'best' X-die. Tree diagrams. Interactivities. Probability. Theoretical probability. Mathematical modelling. Experimental probability. Probability distributions, expectation and variance. Maths Supporting SET. Combining probabilities. Conditional probability.